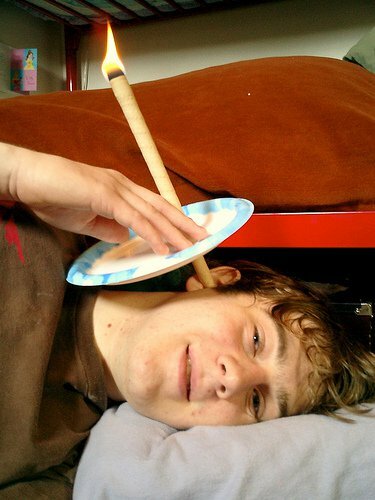 The origins of ear candling have not been firmly established. Some attribute the practice to the Hopi Native American tribe, but the Hopi Tribe quite vehemently deny that ear candling has anything to do with them, and request that people stop associating them with the practice. Apparently, the link originated with Biosun, the largest manufacturer of ear candles in Europe, whose website shows murals of the Hopi Tribe sharing candles. However, these murals are from the "Hopi Tower", a gift shop in the Grand Canyon that wasn't built until 1930 (source: this article). Ear candles are hollow, conical candles made out of a mixture of paper and wax that are usually inserted into the ear canal as shown above, while the end is lit. People usually use a plate or towel around the candle to stop any drips on the outside of the candle from burning the ear or face (but what's to stop wax dripping down the inside of the candle?). What Are Ear Candles Used For? Ear candlers (or "thermo-auricular therapists" as they prefer to be known), insert a lit candle into a client's ear canal, and often give a face and/or scalp massage, and may also play relaxing music. However, do ear candles live up to the hype? A basic knowledge of the anatomy of the ear will tell you that the outer ear (the part of the ear including the auricle, the ear canal and the eardrum) is separated from the middle ear, the Eustachian tube, and the nasopharynx by the eardrum. Unless you have a perforated ear drum, there's no way that an ear candle can have any physical effect on your nose, throat or sinuses, unless you inhale the smoke. 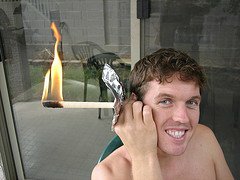 Actually, there is a chance that an ear candle may perforate your ear drum, as although most ear candlers use a plate or towel to protect your face from dripping wax, there's nothing to stop wax dripping down the hollow inside of the candle and severely burning your ear canal and /or eardrum. There are documented cases of ear injuries from ear candles, including a perforated ear drum (see this pubmed article). If you are going to use an ear candle (and we recommend that you don't), the candle should be held horizontally to avoid hot wax dripping into your ear or onto your face. As you can see, the flame can get quite high, so there's a danger that the flame may set your hair alight, especially if you use hairspray and have long hair. I can't really comment on whether ear candles enhance "energy flow", or "aid clarity of thought". As noted above, it is simply impossible for ear candles to help the sinuses, nose or middle ear with conditions such as sinusitis, blocked nasal passages, snoring or glue ear. What about stress relief, relaxation, extracting ear wax, helping hearing loss or treating tinnitus? Ear candlers are often simply massage therapists that have taken extra training to differentiate themselves from their competition. They will often play relaxing music and give clients a face and/or scalp massage, and this is most likely where the relaxation and stress relief component comes from. If you want to relax, I'd suggest you would be better off paying for a face, shoulder and scalp massage and you won't put yourself at risk of ear injury! In the long term, you would be better off practising Mindfulness Meditation. Ear candlers believe that ear candles extract ear wax from the ear canal, reducing wax blockage and improving hearing as a result. The supposedly do this through the "chimney effect". It has, though, been scientifically proven that ear candles don't generate enough vacuum to remove ear wax. Actually, they don't generate any vacuum, and often deposit wax and soot on the ear drum of the recipient. You can find many videos on YouTube confirming this. Many videos on YouTube warn that ear candling is a hoax or that ear candling is dangerous! There are many effective treatments for wax blockage, hearing loss and tinnitus, and we recommend that you look for a qualified and registered ENT Consultant, Audiologist, Hearing Aid Dispenser or Specialist Ear Nurse to look after your ears. If you suspect you have a hearing loss, it may just be wax. In this case, you can have the wax microsuctioned. A good microsuction clinic will be able to look inside your ears and confirm if you have wax or not - many clinics have an ear scan machine that enables you to see inside your own ear on a screen. The ear examination is actually an important part of the procedure, and someone who knows the anatomy and pathology of the ear will be able to detect any problems that need further investigation. If there's wax, they can remove the wax, and afterwards they can do a 1-minute hearing check that will tell you if your hearing is normal, or if you have a slight loss. There are three main medically-approved methods of ear wax removal: syringing, dry instrument removal, and micro suction. Microsuction is the safest and most effective method of ear wax removal. It is suitable even if you have had ear surgery or a perforated ear drum. Some people may not like the noise, as it can be quite loud, but the noise levels generated in the ear canal have been clinically shown to be too low to cause damage to hearing. You can find out more about microsuction here.